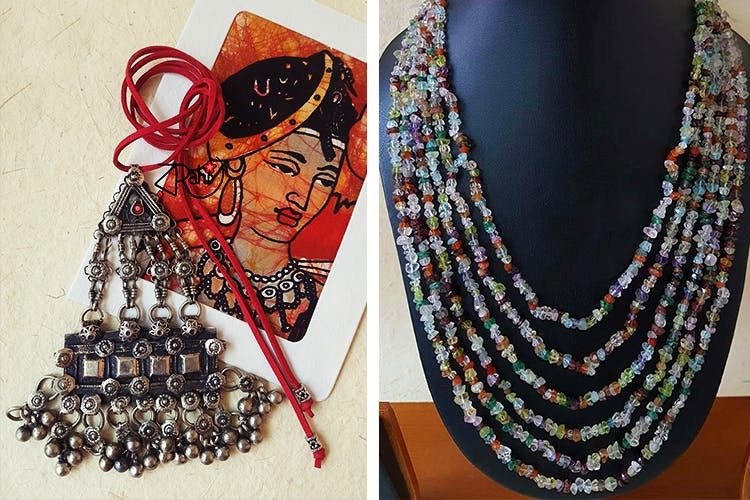 This online range of exquisite handmade jewelry, designed by city girl Aindrilla Guha, has something to suit all tastes and offers something sparkly for all budgets. Aindrilla started Rahi after an unexpected visit to a bead shop in Glasgow and found a treasure trove of natural stones. The shopkeeper helped make her first three-strand necklace. After making her first sale, Aindrilla made more and began selling them in earnest on social media platforms. Each Rahi piece has a distinctive look that the designer maintains by importing high quality natural stones in uncommon shapes and cuts. She uses rhodium-plated, nickel-free material to string them together. Previously an exclusively contemporary, individualist assortment of jewelry, Rahi has expanded into other styles like Tibetan pieces, silver, terracotta and Afghani. What appeals to us about this collection is that these are singular, unique pieces that give you an instant, contemporary look. We absolutely adore the terracotta sets with painted faces on pendants and contrasting peacock feather earrings. The series of banded agates and corals are stunning. Also don’t forget to check out the lapis lazuli pieces with silver beads and uncut crystal, and the stones combined with folk styles like dokra. You can pair them with a handloom sari or with an evening dress. They have a lapis lazuli with original cultured pearls and a silver toggle clasp for INR 2,050. You can pick up a silver pendant with agate for INR 2,150, A terracotta Ganesha is for INR 650. And a striking banded agate slice with uncut rose quartz is for INR 1,150. If you’re looking to experiment with contemporary styles, this is the store for you. Payments are done via online transfer or Paytm. Rahi also holds exhibition-sales from time to time.